As weather cools (then warms and cools …) and day-length diminishes, the gardening year winds down. It’s tempting to think of hibernating, retreating to the warmth of the wood stove, but much remains to harvest, including greens for salad and cooking, and autumn roots: potatoes, carrots, turnips, radishes, beets. During this time of fall production begins planning for the gardening year ahead. We're taking stock of what has worked best in year one of our Restaurant Supported Agriculture experiment, in which Honeywood took the entire Three Springs Farm vegetable production. It has been an exciting time of pushing to grow, and scrambling to harvest, a steady supply of seasonal produce for the kitchen staff to work with, and servers to bring to the table. Arwen and I have felt very motivated in this role as behind the scenes team players every step of the way, from seed sowing, in what I consider to be the Honeywood kitchen garden here on Crooked Creek, to driving the just-picked loads of produce to the Summit twice a week, rolling the stacked-high bushel crates past The Barn, through the restaurant’s back door to be parked in the crammed-full walk-in cooler. We will get our moments of repose to savor in winter, keeping an eye always on the forecast for opportunities to sneak in a little gardening during warm spells. Greenhouse sowing for 2018 will get underway before we know it, and seeds will be sprouting. The rejuvenating power of winter will have worked its magic and we’ll launch ourselves headlong into another growing season, having forgotten all about the sweat, backaches, pesky weeds, and biting bugs of the year before! 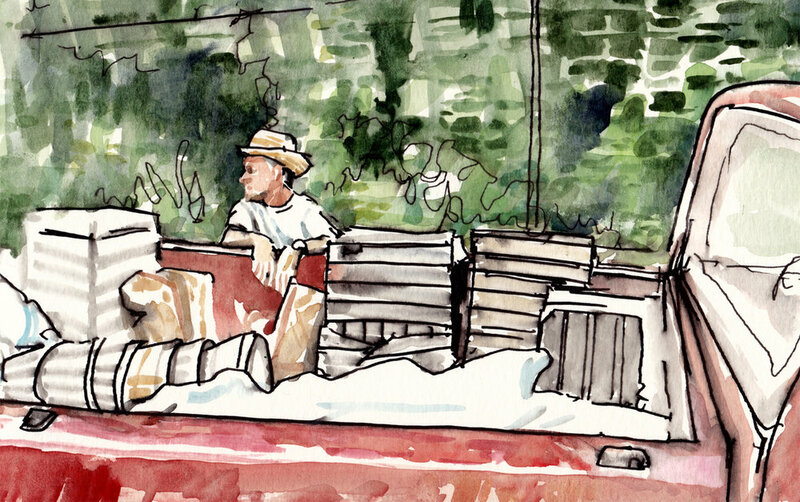 David Wagoner is married to Arwen Donahue, whose drawing journal Landings consists of 130 drawings and stories documenting daily life over the course of a year at Three Springs Farm. See more at arwendonahue.com.